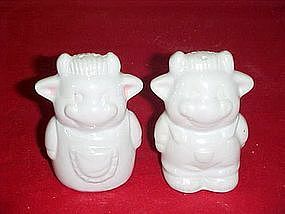 These salt and pepper shakers were probably once painted. They are all white and made of china, but no stoppers. A farmer cow and his wife. These would be a cute paint project or just use them as they are. No damages. MEasures 3 1/4" tall.